We are ING ! We believe the second half of life is the golden age to fulfill and explore. Therefore we name ourselves "ING" illustrating our passion to explore something new every day. In fact when one completes the first half, it is time when we have accumulated decades of experience, wisdom and friendship. It is time to move on. 2018 was a rewarding year to the Active Ageing (AA) Team, we • Using innovative thinking and co-creation to design services for 50+ used new approaches to co-create new experiences with the 50+ • Witnessed the bath of the ﬁrst of its kind 50+ Start Up Project with an aim to provide 50+ a platform to start their new venture • Collaborated with the Hospital Authority to develop a platform that supports the demented elders and build up supportive network for carers • Awarded the Best Active Ageing Programme healed to Singapore to run the Elder Care Innovation Awards and received the Best Active Ageing Programme – Community T h e i m por tant moments ha ve illustra te d our im pa ct s m a de a nd we v e r y m uch va l u ed th e contribution a nd sup p o r t a n d t r us t f rom a l l s ta ke hol de rs . I n t he co mi ng y ear, the AA Tea m will conti nue t he jour n e y of in nova t ion t ha t focus e s o n u ser i nvol vement . Plea se sup p ort us a s a l wa ys . T ha nk you! and services in the years ahead. the singleton elderly will be implemented. It is expected that no elder will be alone and helpless in hospital by providing necessities, supportive information and visitation with love and care. *由香港賽馬會慈善信託基金策劃及捐助「賽馬會教師社工創新力量」 計劃，旨在培育社福界具創變能力的人才，鼓勵社工以創新意念及具體 行動回應社會的需要與挑戰! “InnoPower@JC: Fellowship for Teachers and Social Workers” which is funded by The Hong Kong Jockey Club Charities Trust, aims to build innovative capacity of social workers in Hong Kong, so that inspire them to generate innovative solutions to address the increasingly complex social issues in the 21st century. Funded by the Hong Kong Jockey Club Charities Trust, this three-year initiative aims to promote the values of active ageing through startup activities. This initiative provides training workshops, start-up fund, consultation services and a free co-working space for the winning teams. This initiative has completed a successful ﬁrst cycle, with a total of 8 winning teams launching their own startup businesses. We look forward to more social innovation projects led by 50+ in the coming years. 第 一 屆「 賽 馬 會 50 +創 豐 盛 計 劃 」得 奬 創 業 隊 伍 於 台 上 領 獎 Wi n n i n g s ta r tup tea m re cei v ed a wa rd a t the ce re m o ny. 我們透過「連結」共創生活遠景！ 我們透過「共同探索共創夢想生活！」 We live and design our life in collaboration with others. We design our dream life through a process of co-creation. 創老工作室於2018年6月舉辦「理想點老好」工作坊。約40名50+ 參加者當天與職員透過設計思維，從服務使用者角度出發，一起探 索如何在人生下半場去「創造連結」。 InnovAGE Team has organized the ﬁrst Design Your Life Workshop in June 2018. 40 participants together with our facilitators engaged in a design journey in exploring the theme Social Connectedness. 「50+仍然充滿熱情、創意!」 「我們仍很有生產力呀!」 “The 50+ are passionate” “innovative and productive” 當 天 ，四 個 與 社 交 需 要 有 關 的 點 子 在 5 0 + 共 同 「 度 橋 」 下 誕 生 ， 例 如 ： 50+戀 愛 無 限 露 營 、 50+ 網 上 學 習 平 台 等 。 50+悅 齡 服務期待 繼續與50+一同探索50+組群的需要，共同創造點子，並積極把創 意力和影響力帶到城市，共創解決方案。 4 ideas related to the social needs of 50+ were jammed and created, including a 50+ Love Camp, a 50+ e-learning platform etc. 50+ Active Ageing Services is looking forward to engaging more 50+ in sharing their needs, jamming ideas and solutions; as well as bringing innovative ideas and greater impacts to the city. 深層探索， 認 識 自 我！成 就 更 多！ The Moment to dig deeper and know thyself! launched two sets of 50+ life exploration tool (50+ Becoming More Series) and 100 participants from social care sector joined our “50+ Good Life Seminar” in September 2018 for exchange of hands-on skills in designing better life for the 50+. with cross-professional in order to design service and products with the 50+. Through collaboration and experience exchange, we aim to enable the 50+ to set a clearer direction towards a flourishing second half of life. In February 2017, True Light Villa & Shun on DECC started a 2 years ‘Dementia Community Support Scheme’. The scheme is under the medical-social collaboration model, which is the ﬁrst collaborative service among Hospital Authority, Social Welfare Department and NGO. The scheme promotes diﬀerent connection of DECC within the district. By adding diﬀerent medical professionals in the team of DECC, which build the capacity of DECC team in handling dementia cases. Throughout diﬀerent training modules in the programme, which allows demented elders to re-connect with peoples and the community. The carers programme including talks, workshop on dementia and introduction of community resources can build up a supporting network for carers and release their burden. The scheme is a multi-sectoral collaboration among diﬀerent stakeholders. The case sharing and cross-disciplinar y communication through monthly case conference and periodic cluster meeting provided experience sharing and revamp traditional mode of ser vice deliver y. This build up a foundation on community network and opportunity on partnership in the future. “I always focus on how to take good care my mother, and I just realized it is also the time for me to focus on my physical ability.” -- from Miss Kwong “That’s great and relieved to talk about myself during the course as I feel somehow tired and exhausted to talk about my caring work.” -- from Miss Mak “ I am told to set my goals on how to self-care and take little steps to achieve it. It is an exciting learning moment that I experienced.” -- from Mr. Yip Carers are easily stretched to their breaking point and fall in the trap of self and social-isolation. Building a community with sense of connectedness, 20 carers can easily feel how important it is to be surrounded and supported in our newly-established program “Carer Academy”. Not only are the carers equipped with fundamental knowledge and skills on caring, they also co-work and co-create to initiate a life planning for themselves, so as to minimize their worries and fear about future. Appreciation were received from the participants who described the course meaningful and gracious. Participants realized the importance of "re-deﬁne themselves" and "planting time for themselves" - "You can't pour from an empty cup. Take care yourself ﬁrst." Walking Kwun Tong for Active Ageing aimed to promote a walkable environment for the elderly and build walking habit for the elderly. The award was presented in Singapore and recognized exceptional aged care agencies for their innovative and quality approaches to change the way senior’s age, and for their contribution in shaping the future of the ageing landscape. 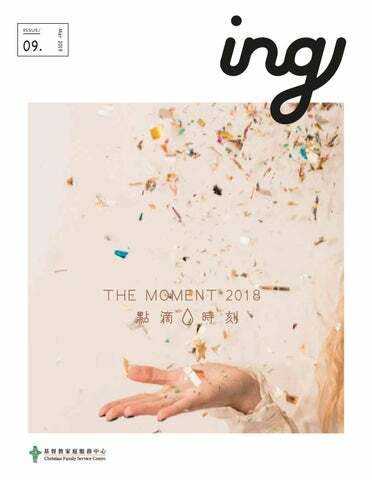 The moment of recognition 50+悅齡服務屢獲殊榮，讓同事和長者們感到振奮！於2018年11月舉行的「2018老有所為活動計劃」頒獎典禮上，真光苑長者地區中心憑「長者齊參 與，我們是一家！」獲社署頒發「地區最佳活動計劃」及「全港最佳活動計劃」亞軍 (兩年計劃) 兩個獎項，而順安長者地區中心則以「友里商鋪街坊 情」獲頒「地區最佳活動計劃」 (一年計劃) 獎項。來自兩間中心的同工和長者們在現場見證頒獎時刻，氣氛緊張又興奮，真的感受到「我們是一家」啊！ Our working teams felt encouraging for receiving the Award of Best OEP Projects presented by the Social Welfare Department. The Project “We are in One Family with Elder’s Participation” conducted by our True Light Villa DECC gained the 2016-18 Kwun Tong Best OEP and First Runner Up of HK Best OEP (Two-year Project), while the project “Neighborhood Love among Community Shops” conducted by the Shun On DECC gained the 2017-18 Kwun Tong Best OEP (One-year Project). Our colleagues together with our elder participants witnessed the moment of award giving, and really felt “we are in one family”! 兩個活動計劃均重視社區的人情味，『友里商鋪街坊情』主要發掘觀塘區的友善商鋪， 並以市集形式展現商鋪與地區街坊之間的人情味；『長者齊參與，我們是一家！』則 著力鞏固鄰舍互助網絡，加強對弱勢長者的支援。社區人情味，就是這樣靠街坊鄰里 一點一滴的互動關懷而累積起來的。我們能參與其中，真的很感恩啊! The two OEP Projects both focused on the building up of community bonds. The Project “Neighborhood Love among Community Shops” mainly dug out the love stories between elders and local shops, while the Project “We are in One Family with Elder’s Participation” devoted to network social bonds among neighbors so as to strengthen the support to the single elders. That’s the way community bonds are built up with human interactions bit by bit, and we are delightful that we are the part of the builder.